in rubber wood / bamboo. KITCHENS TO ADORE Feast your eyes on 10 kitchens that cater for all tastes – from cool and contemporary to eclectic and elegant. ver See more of our front co home from page 66. It feels like a major lifestyle change happened since my last editor’s letter, so let me fill you in! I finally sold my one-bedroom apartment (after five long months of being on the market) and made the move from busy Chermside to the much quieter seaside suburb of Woody Point. We decided to rent initially, and we’re enjoying living in a townhouse just 100 metres from the beach. Each afternoon, my partner and I stroll along the boardwalk, taking in the sea views and breathing in that salty air – pure bliss! 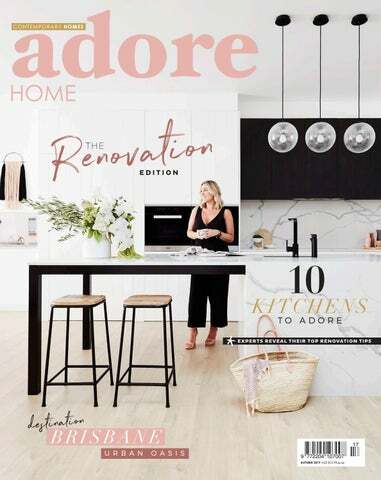 If you follow Adore Magazine on Instagram, you might have seen that I decided to sell my apartment privately without an agent, through buymyplace.com.au (this is not sponsored, by the way). I would have made a huge loss with an agent at the price they wanted to sell it for (I had three appraisals, and all valued it $30,000–$60,000 less than what I paid for it brand new only two years ago). That’s Brisbane’s current apartment market for you! So, facing what seemed like an impossible task, I took the plunge and listed my apartment on the major property sites. I held multiple open homes on my own, then finally found a wonderful buyer who was downsizing. I managed to sell my unit for what I paid for it – and saved myself $15,000 in agent fees. Selling your own home isn’t for everyone; I totally get that. But it was actually easier than I’d anticipated. All you need to do is answer emails and calls from prospective buyers and host open homes. If you were with an agent you’d have to clean your home before inspections anyway (that, to me, is the hard part!). And popping on a smart outfit (a blazer will make you look the part) and hosting your open house for half an hour is not that bad. Your lawyer can take care of drafting up the contract for a fee (something I wasn’t confident enough to do myself). Easy. If you find yourself in a similar situation to mine, or you just want to save your hard-earned dollars, I dare you to give it a go! And, if your home could do with some work ahead of selling, check out our renovation tips on page 32. We picked the brains of experts to find out where to splurge and where to save in order to improve the functionality and value of your home – including using a styling company to stage your property and boost its price tag. Wherever you are in your renovation and real estate journey, I wish you the very best of luck! It can be tough but the rewards (hello seaside!) can be so sweet. Holder Vase in Dark Teal Glaze in by Vivienne La décor We’re predictingCeramic that arches, terrazzo and $160 moderntimes.com.au with a Japanese twist will be trending in 2019. Australian made PolyLux® Shutters, manufactured in 2 weeks. Installation available in Melbourne, Sydney, Brisbane and the Gold Coast. Ancient patterns and rich textures are expertly balanced with clean lines and layers of white in the kitchen of interior architect Georgia Ezra, who designed it as part of a full renovation of her 1920s semi-detached home. Honouring the original bones of the building – including brickwork that was exposed during the reno (“I didn’t have the heart to plaster over it”) – Georgia envisioned the kitchen as a melting pot of Mediterranean influences: “light, textural, inviting, aromatic and full of love”. Carefully curated cultural references extend to the room’s bespoke arched windows and doors, as well as the handcrafted Moroccan mosaic tiles from Georgia’s own company, Tiles of Ezra. Kitchens are the hub of family life and need to cater for a range of people and activities that often happen in parallel – cooking, eating, homework, admin, socialising and more. “Space, storage and ‘good flow’ are critical for the success of every kitchen,” says Sara Bryant of Bryant Alsop Architects, whose design for this kitchen incorporated a walk-in pantry, a connected nook for kids, a built-in desk for the family computer, bookshelves and extensive storage space. The kitchen, which connects a traditional Edwardian house with a contemporary extension, balances a classic style with playful touches, like recycled newsprint wallpaper behind the desk. The owner’s brave colour choice ensures this hardworking zone is as handsome as it is handy. In this calm, minimal kitchen, layers of grey are deftly balanced with textural elements and strong lines. Cassie James-Herrick of CJH Studio explains that the client wanted a space that was both practical and aesthetically beautiful. A butler’s pantry, concealed appliances and full-height joinery allow for a streamlined look. Hard, flat surfaces are interrupted by curved handles and the subtle stone textures of the benchtops, splashback and floating shelf. “No overhead cabinets allow the kitchen to feel a little more generous in proportions than it really is,” says Cassie. “And it provides a unique opportunity to create some personality too.” A dramatic black rangehood breaks up “potentially overwhelming” soft greys and accentuates the ceiling’s height. Traditional elements are perfectly balanced with contemporary flourishes in this calm and collected kitchen in the English seaside town of Hove. The work of kitchen design company deVOL, the bespoke green paint on the Shakerstyle cabinets pays homage to three gnarled olive trees that grace the garden of this terrace house. The homely palette and nostalgic brass handles and tapware are juxtaposed with modern Silestone quartz benchtops, a polished concrete floor and slick pendant lights, creating a space thatâ&#x20AC;&#x2122;s simple and stylish. “Black and white is a classic combination that will always remain stylish,” says Saskia Steinhart of Design + Diplomacy. For this suave kitchen, they incorporated a variety of textures to soften its stark monochromatic palette. The Polytec ‘Ravine’ laminate joinery provides a theatrical backdrop for the kitchen’s focal point, the ‘Calacatta Nuvo’ Ceasarstone island bench. Beneath it, show-stopping 3D ‘Triangle’ tiles (from the Rombini collection designed by Ronan and Erwan Bouroullec for Mutina) are transformed through the day with the movement of sun and shadow. Saskia’s styling advice for contemporary kitchens? Keep it simple; use natural elements like plants and timber accessories to add warmth; and invest in quality furniture that will stand the test of time. Rita Donahoe of Rita Chan Interiors in California was determined that this Manhattan Beach kitchen wouldn’t be “just another white kitchen”. Keeping the style classic, she warmed it up with a white oak island bench and gleaming brass pendant lights. Handmade square tiles (chosen as an alternative to the popular subway tile) bring subtle movement and texture to the space. Running cabinets all the way to the ceiling keeps things modern (“How often do you see that gap look amazing? In the U.S. it tends to be home to fake plants, pottery that just may fall on your head, or poor porcelain roosters all covered in dust!”), while shiplap panels create an air of coastal charm. DESIGN SKYE BRYANT / BUILD DB BUILDING / PHOTOGRAPHY THE PALM CO. Catering to the long, lazy days that characterise coastal living, this kitchen basks in abundant natural light. Beneath a lofty ceiling, white is the order of the day – from the streamlined cabinets to the lighting and island bench. “If possible, allow 1100mm around your island,” advises interior designer Skye Bryant. “Your kitchen will feel spacious and allow for movement when more than one person is using it.” Skye incorporated blackbutt timber shelves, providing a flexible display space and adding warmth and texture. The window splashback integrates the outdoors; try golden cane or rhapis palms for an instant green hit. After launching TDM Project Management last August Saretta is full of enthusiasm and ideas for the year ahead having just returned to Brisbane after a monthlong sojourn in Europe getting to grips with the latest and greatest products on show at Maison et Object, Christmasworld and Ambiente trade shows. According to Saretta, TDM Project Management was founded on expertise in product development and a desire to share that knowledge with others. Having worked for some of the Australasia’s most notable retail brands, Saretta has distilled her years of knowledge into a consultancy framework based on a forward thinking, bespoke service. Saretta says since launching TDM Project Management she is loving the opportunity to work with likeminded others and doing what she does best, matching the right ideas with the right businesses. 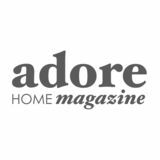 Love the products you see featured in Adore Magazine? DonĘźt waste hours trawling the internet and looking up products separately. Search hundreds of stunning products from our favourite brands and retailers listed below. EMILY'S TOP RENO TIPS 1 Live with it: Try and live with the existing space to figure out how it can be improved. For us, it meant realising we needed water access, better drainage and lighting. Not exactly exciting stuff, but it's the little things that have improved the functionality of the space. 2 Think global: Don’t be limited to what’s available locally; look online and find suppliers interstate or overseas who offer different products, so you don’t have to compromise. Our beautiful zellige tiles from Tiles of Ezra are imported from Morocco; the pot is from India; the beaded chandelier travelled with us back from Bali; and the copper shower rose is from Heritage Bathware in New Zealand! 3 Don’t be afraid of colour: Colour creates visual interest and, importantly, evokes ambience, which is essential in entertaining areas. DESIGN AND STYLING BONE MADE / PHOTOGRAPHY THE PALM CO.
MARIA'S TOP TIPS 1 Focus on layout: There’s nothing more frustrating than a bathroom that doesn’t work! Design the layout before you get too involved in how it will look aesthetically. 2 On trend tapware: Tapware can make a big difference to the look of a bathroom. I love matte black and metallic tapware; it can instantly bring an extra level of sophistication to a space. 3 Stylish accessories: A few chic pieces can go a long way towards giving your bathroom a five-star feel. Greenery, luxurious towels and beautifully packaged vanity products can create a hotel atmosphere at home. “When we first saw the house, the outside was a custard creamy yellow colour, with dark-green gutters and trims. The security screens were old, and the fence was completely run down.” Boldly repainting the exterior in Taubmans ‘Peach Cascade’, and adding a new front door, laser-cut palm screens from Decoview, whitewashed front steps and an endearing picket fence with bamboo-roofed gateway has given the home a new lease on life. “It’s even been used as a shoot location and event space,” says Nicola. If drenching your home in a bold hue isn’t your style, you could try a punch of colour on the front door. Andrea Pienaar of SIBA Interiors tried 13 different sample pots on her home (pictured top right on the opposite page) before she settled on the perfect blush shade for her front door – Taubmans ‘Beige Pink’ – as a counterpoint to the dark exterior palette. Fences and landscaping are also useful elements for framing the façade of your home – it’s hard to go wrong with a white picket fence for older-style houses. When she designed the entrance to this all-white beach house (pictured at the bottom of the opposite page), Skye Bryant opted for lush greenery in contemporary pots of varied sizes. Aside from fresh paintwork, says Skye, “greenery always completes the look and softens the exterior”. Looking to give the front of your home an instant facelift? “Paint alone can transform the feel of a place and make it look brand new again,” stresses Nicola Murray, who worked with her mum to reinvent a dilapidated bungalow as a playful Airbnb rental, pictured left. THREE BIRDS’ TOP TIPS 1 Paint: Paint all the walls before the cabinetry goes in. It’s better for your painter and helps to protect the cabinets from paint splatter. For cabinetry, we prefer a satin finish, which is easy to clean and doesn’t show fingerprints. 2 Taps: Tapware is not a place to scrimp – but expensive taps aren’t necessarily worth their price tag either. We suggest choosing mid-range tapware by a reputable brand that offers a warranty. If you’re a first-time renovator or looking to build from scratch, sign up for an online course with Three Birds Renovations’ Reno School and learn how to reno like a pro. 3 Flooring: If you’re installing new flooring, ask your cabinet maker, carpenter and flooring company if it should go in before or after the cabinetry. There isn’t one rule – it all depends on the type of flooring and your cabinet maker’s preference. We’ve done it both ways in previous renovations. Colour Tip If you’re nervous about going all the way with colour in your kitchen, you can limit it to just the island and use white everywhere else, as Three Birds have done in the kitchen pictured here. STAGING “Professional stylists see the property through a buyer’s eyes and create a new story that adds value,” explains Sara Chamberlain, who runs The Real Estate Stylist company with her sister Amy. They stress that most buyers scour online platforms when househunting. “A bad photo can be enough for them to not even click through to your property. First impressions count!” Stylists’ fees vary (The Real Estate Stylist charges around $6,500 plus GST for a six-week hire campaign on a three-bedroom property, which includes installing a full house of furniture with linen, outdoor furniture, art, lamps, and more). “We have a 90 percent clearance rate for our properties, in a market with an average of 50 to 60 percent,” says Amy. She adds that it’s handy to get advice from your chosen stylist and check their schedule before engaging your real estate agent. TOURS Four sets of homeowners take us inside the houses theyâ&#x20AC;&#x2122;ve meticulously transformed. L I V I N G Sofa from Harbro; coffee and side tables from Curious Grace; Luminette privacy sheer blinds from Luxaflex. K I T C H E N Alisa and Lysandra turned to former The Block contestants Chris and Jenna who recently opened their very own kitchen showroom â&#x20AC;&#x201C; Kitchens by CJ. "Luxury to us means creating a space that feels extra special." M A S T E R B E D R O O M “We kept the original features in the first section of the house, which includes the hallway and the master bedroom, with decorative cornicing, skirting and ceiling roses,” says Lysandra. Artworks from The Art and Framing Co; custom bedhead from Harbro; bed linen from Aura Home; pendant light from Beacon Lighting. E N S U I T E A N D W A L K I N R O B E The underfloor heating and plunge pool in the ensuite create a level of luxury whilst bespoke cabinetry in the walk in robe ooze sophistication. Tapware and shower head from Sussex; tiles from Beaumont Tiles; vanity, basins and towel rail from Reece. Heavenly sanctuary M A I N B A T H R O O M Alisa and Lysandra have created a heavenly sanctuary in the master bathroom, complete with twin showerheads and double sink vanity to really amp up the luxe factor. Tapware and showerheads from Sussex; floor and wall tiles from Beaumont Tiles; bath, vanity, basins and towel rail from Reece. Set a budget. It may need to be tweaked but make sure you keep an accurate record throughout your project. Invest in competent trades that you trust. Shoddy work and misunderstandings will cost you time, money and stress. Simple and low-cost improvements like fresh paint, new bathroom fixtures or new hardware on cabinetry can make a big difference. Beware of passing trends. Think about your true preferences, as well as resale appeal down the track. Layout is a very personal thing. When designing your floorplan take the time to map it out and take into account light, ventilation and the overall flow of the house. STEAL Longing for that luxe factor? Get Alisa and Lysandra’s contemporary style with these finds. F A R M H O U S E A P P E A L Concrete Cambridge roof tiles in ‘Soho Night’ from CSR Monier; barn lights from Barn Lights Australia; House number ‘seven’ from BoBject. Rachael Turner, founder of Front Porch Properties, shares the rewards of becoming a builder and how she transformed an old home into a stunning modern farmhouse. C A L M D I N I N G R O O M The palm leaf wallpaper from Wallpaper Trader creates a calming atmosphere in the window seat nook in the dining room. Pendant light from Sunday Society. L I V I N G R O O M The stone veneer from Infiniti Stone (on the fireplace) creates an authentic farmhouse-style space. Horse print from Urban Road. O U T D O O R D E C K Zero maintenance composite decking from Ultra Deck; outdoor cane furniture from Malawi Cane. Though Rachael typically implements all interior design and styling herself, the enormity of this project required additional help. So, she enlisted Gold Coast-based Soul Styling Interiors to ensure the home was styled in time to hit the market, proving again that no task is insurmountable. S H O W - S T O P P E R K I T C H E N Ash concrete benchtop (on main wall) and Carrara benchtop (on island) from Essa Stone by Laminex; tapware from Phoenix Tapware; hardware from Lo & Co Interiors; Regal Oak timber flooring in Astor from Godfrey Hirst. W A L K - I N R O B E Individual flower wall decals from Rocky Mountain Decals create a dreamy, romantic space. Plantation shutters from DIY Blinds; pendant light from Wanderlust 4 Lighting; cabinetry hardware from Tradco Hardware; carpet in upstairs bedrooms and walk-in robe by Godfrey Hirst. J U S T F O R K I D S Polka dot bedding by More Than Ever; leather cushion and bunting from Coco Rose Interiors; wall mural from Wallpaper Trader; art print from One Tiny Tribe. E N S U I T E The ensuite was formerly a bedroom. Due to its large size, Rachael decided to build a wall in the middle of the room to keep the space from feeling too vast. Tiles from TileCloud. Trop ical vibes B R E E Z Y L I V I N G R O O M Rachael says the second living room, pictured, is one of her favourite rooms in the home. “You could sit up here with a book and a glass of wine or simply enjoy the city views,” she says. “My favourite part of the room is the wallpaper, which I actually installed myself!” Wallpaper from Rocky Mountain Decals; rug from Dutch Warehouse; cushions from Coco Rose Interiors. STEAL For coastal-meets-farmhouse style, you can’t go past these classic finds. CONTEMPORARY KITCHEN “Adding heaps of natural light was essential, which was achieved by adding four skylights above the kitchen and the steel-framed glass doors off the living room,” says Courtney. Pendant lights from About Space Lighting and bar stools from GlobeWest. Three years ago, Courtney and Marcus Leslie and their son Noah welcomed baby girl Isla into their family. It was then that they decided their single-fronted Edwardian home in Melbourne’s Glen Iris needed to expand as well. “Having lived in the home for four-and-a-half years, we knew what worked and what didn’t,” explains Courtney, an interior stylist. “So, we had a firm idea of what we wanted to achieve from our renovation.” They needed a large open-plan living space, with a playroom near the kitchen that allowed them to watch over the children. Besides the kitchen needing a refreshed look and layout, Courtney recalls, “We only had a small European laundry – and with two young kids, we needed a fully functional laundry.” So, while the Leslies would be able to retain their two front bedrooms, central hallway and period features, an all-new living space at the rear of the property had to be built. “Pretty much a full overhaul,” says Courtney. After 18 months of planning, Courtney and Marcus embarked on the challenge of renovating as owner builders, requiring them to supervise and/or commence all the work themselves. They did both. Fortunately, Marcus is an electrician, and no stranger to the building process and the work involved. Regardless, the couple had their work cut out for them. “To avoid lengthy and often costly delays, we finalised all our selections prior to starting." “We had to be extremely organised and be across all aspects of the build. To avoid lengthy and often costly delays, we finalised all our selections prior to starting. We also created a budget spreadsheet and updated it daily to remain on track.” The family had to empty the home and move out for six months. And while Marcus assisted the various trades to save on labour costs, he still had to oversee his own electrical business. “And I had a four-month-old and a three-year-old to look after,” adds Courtney. “It was hectic!” But worth it. The completed renovation proved lifechanging for the family, giving them two revamped full bathrooms; an open-plan living area; a revitalised kitchen with butler’s pantry; a designated playroom; an expansive laundry; and a reconfigured master bedroom > with walk-in-wardrobe and ensuite. > L I G H T - F I L L E D L I V I N G The living room is Courtney’s favourite. “I’m constantly changing the artwork on the gallery wall. I love how, just by changing a few cushions and throws, you can almost completely transform the space.” Art prints from Norsu Interiors, Designstuff and Olive et Oriel; coffee table from Harpers Project; sofa from Sketch; armchairs (with white covers) from Hermon & Hermon; blush leather armchair from Barnaby Lane. D I N I N G R O O M “My favourite feature of the home is most definitely our large steel bifold doors,” says Courtney. “When we decided to renovate, steel doors were number one on the must-have list, and we essentially designed the home around these doors.” Table from Maison Est; chairs from The Banyan Tree Furniture; Normann Copenhagen ‘Bell’ pendant light from Arrival Hall; bench seat from Barnaby Lane. M A S T E R B E D R O O M The bed from Snooze is dressed in an array of sumptuous textures, including a chunky knit throw from Nickel.N.Co, linen from Country Road and cushions from Eadie Lifestyle, Norsu Interiors and The Banyan Tree. On the Middle of Nowhere side table sits a beautiful flower arrangement from My Flower Room. I S L A â&#x20AC;&#x2122; S R O O M Bed from Snooze; wallpaper from These Walls; canopy from Numero 74; grey pom pom throw from Rose Avenue Home; pink bench seat from Incy Interiors; rocking horse from Adairs; Kreativitum art prints from Designstuff. B A T H R O O M Mirror from Middle of Nowhere; wall light from Lucretia Lighting; vanity, Milli ‘Axon’ rose gold mixer and Omvivo ‘Venice’ basin from Reece. STEAL Want Courtney’s Scandimeets-contemporary style? Get the look with these products. L I V I N G “When I realised that the original mixed hardwood flooring could not achieve a whitewashed look, I decided to add all-new flooring and installed some gorgeous oak engineered timber flooring. It was an extra expense but totally worth it, as it gives such a great feel when you walk in the door,” explains Kate. Sofa custom made; entertainment unit from GlobeWest; rug from Armadillo&Co. With its raked ceilings and exposed rafters, this 1970s home had good bones but just needed a refresh to bring it into the 21st century. C O M P A C T K I T C H E N “The kitchen needed to be well equipped as a holiday home, so I made sure it had everything a guest would need if they were staying for an extended period of time,” explains Kate. “I integrated a fridge and installed a studio pack (a small cooktop with compact oven and integrated dishwasher below it) from Fisher & Paykel, as it was both stylish and space-saving.” Brass tap from Sussex Taps; bar stools from wholesaler Emac & Lawton; light from Beacon Lighting. The small kitchen lacked sufficient storage. A new kitchen was installed, along with a gas strut window to link to the back deck. O P E N W A R D R O B E “I created open robes, so guests have somewhere to sit their suitcase, hang up any clothes and access them easily throughout their stay,” says Kate. Leather hanging rail custom made by H+G Designs. Other design decisions revolved around the practical needs of holidaymakers. The home’s light-coloured flooring and rugs hide beach sand, and the indoor/ outdoor fabric covering the sofa and bench seat were chosen for durability. “I also created open robes, so guests have somewhere to sit their suitcase, hang up any clothes and access them easily throughout their stay,” explains Kate. With no detail overlooked, this cleverly transformed beachside gem is now offering Airbnb guests a stylish, comfortable space to relax and enjoy the Sunshine Coast’s idyllic lifestyle. KATE'S TOP TIPS 1 CLEAR VISION Have a clear vision before you start. Think about how you want to use the space and whether you need more storage, lighting, etc. 2 INCLUDE TEXTURE Think about more than one element of design. Include texture – it’s my favourite! 3 DON'T LOCK INTO ONE STYLE Don’t think your home has to be a particular style, as it can end up looking too themed. For a laid-back beach house, get the look with these finds. DEVOUR Say hello to the freshest gourmet delights. N AT U R A L B E AU T Y O F S HANDMADE CERAMIC Zakkia have expanded their ‘Speckle’ range to include small, medium and large plates, bowls, jugs, serving dishes and more. In colours of pink, seagrass and snow, the pieces combine effortlessly to create a dreamy table setting. Zakkia's beautifully handcrafted ceramics are made using natural materials and traditional methods. A jungle oasis in the heart of Sydney’s CBD, Verandah Bar and Social is perfect for a cheeky martini or an elegant meal with friends. Designed by Luchetti Krelle, the eclectic interior is layered with Art Nouveau forms and botanical elements. Whether you’re after a quick snack or a languid feast, award-winning chef Brad Sloane’s Modern Australian menu has you covered. TALK From tropical Queensland to the lively cities of Sydney and Brisbane, weâ&#x20AC;&#x2122;ve got your next holiday covered. Yes please to the swim-up bar! The Queensland tropics meets mid-century California in this Townsville hotel. Following a two-year renovation by architectural firm Woods Bagot, the upgrade capitalises on the area’s verdant landscape and water views. Fans, broad verandas and timber panelling echo traditional Queensland design, while retro furnishings are given a tropical treatment in crisp white and emerald green. Install yourself at the swim-up bar in the infinity pool and gaze across the Coral Sea to Magnetic Island as you count your blessings! VISIT stay THE CALILE HOTEL If you’re looking for a holiday oasis in the heart of hip Fortitude Valley, the Calile Hotel has it all. Dubbed Australia’s ‘first urban resort’, this James Street stunner is the work of internationally renowned Richards and Spence architects. The hotel takes its design cues from Palm Springs, Rio and Mexico City, mixing it with Queensland’s subtropical flair throughout its 175 rooms, pool deck and terraces. Breezy white brick invites us into a world where marble finishes enhance everything from the elevated pool area (complete with cabanas and alfresco dining) to the soothing rooms and suites. Each room is a pastel paradise sporting modern furnishings and cork floors with luxurious brass accents throughout. It gets more sublime, with opportunities to indulge at the award-winning Hellenika Restaurant, rejuvenate at the day spa, unwind at the cocktail bar, or treat yourself to some retail therapy at street level. stay OVOLO THE VALLEY Fun, funky and full of personality, this boutique accommodation designed by celebrated international firm Woods Bagot revels in Fortitude Valley’s diverse culture. The result: a 103-room haven brought to life with vibrant colour, eclectic furniture, whimsical art and statement wallpaper. From the moment you walk into its neon-lit foyer, Ovolo The Valley playfully intertwines art and entertainment, inviting you to indulge and be yourself. And it gets even cooler, with perks like a rooftop swimming pool, gym and sauna – plus complimentary mini-bar, breakfast, Wi-Fi and happy hour. must try A trip to Nodo wouldn’t be complete without a gluten free donut, but be sure to also try their delicious lunch menu. eat NODO DONUTS One of the sweetest cafés in Brisbane’s Newstead, Nodo Donuts makes it perfectly acceptable to eat donuts for breakfast, by putting the fun back into wholesome food. Beetroot Blackout, Pumpkin Maple or Strawberry Hazelnut donut, anyone? You’ll also relish a seasonal brunch menu that includes hotcakes, grass-fed brisket burgers, salad bowls and superfood shakes – each boasting a medley of nourishing ingredients and tasty toppings. It’s gluten-free deliciousness that’s worth writing home about. drink MR PERCIVAL'S Brisbane’s exciting new Howard Smith Wharves precinct includes Mr Percival’s as part of its riverfront revival. Make this your destination for aperitivo-style bar snacks and a designer atmosphere worth savouring. Infusing elements from Europe’s iconic beach clubs, Brisbane designer Anna Spiro is behind Mr Percival’s ‘yearlong summer’ motif of arched doorways, which connect indoor and outdoor dining. Its sage-green floor tiles with Moroccan bordering, terracotta marble tables and whimsical ’70s-inspired cushioned seating are enlivened by salmon pink umbrellas, natural timber, and splashes of yellow and blue. With everything from crispy fried school prawns to warm baguettes with whipped cod roe dip, there’s no better place to savour Brisbane’s balmy days and nights. stay W BRISBANE Glam getaway meets poolside paradise at the new W Brisbane. Located in the CBD and overlooking the Brisbane River, this cosmopolitan hotel features lavish guestrooms and suites with modern furnishings inspired by lounge grooves and spectacular river views. It gets even more VIP on the rooftop WET ® Deck, a chic tropical retreat that invites luxurious poolside lazing by day, and revelling after sunset with live DJs, Aussie barbeque dining and impeccable cocktails. shop JAMES STREET Like a little retail therapy? You’ll love the James Street precinct in Fortitude Valley, with its impressive array of design showrooms, fashion boutiques, bars and restaurants. Lush green landscaping provides a serene backdrop for some serious indulgence. Contemplate decorating ideas at west elm, Pottery Barn, St Barts, Jardan and other faves. Then zjoosh up your wardrobe at Mister Zimi, Bec + Bridge, Camilla, sass & bide and beyond. Award-winning restaurants and cafés will see to it that even your palate feels pampered. selfie EL’ ROSA Fancy a garden party for two? You’ll snap the sweetest selfie at El’ Rosa – a little slice of utopia serving the prettiest specialty drinks, ice creams and pastries. Located in the backyard of James Street’s own Arc + Family (retailers of hand-painted pots and owners of El’ Rosa), this pink-andwhite wonderland treats visitors to Moroccaninspired doorways, tropical foliage and romantic furnishings – an Instagrammer’s dream, with the drinks to match. Try the ‘El’ Rosa Rainbow’: a vanilla-and-rose float with pink cream, gold dust and fairy floss. The zucchini chips at Hellenika are a must! The crunchy batter make these simply irresistible. eat HELLENIKA A tantalising taverna experience awaits at Hellenika, serving award-winning Greek cuisine as sister to its celebrated Gold Coast location. Nestled alongside the elegant pool deck of the Calile Hotel, Hellenika masters timeless Greek delicacies in a coastal-inspired white setting with modern timber, marble and pastel accents. Imagine your favourite traditional cheeses (kefalograviera, feta), meats (lamb, veal, beef, pork), seafood (octopus, spanner crab, local fish), dips and greens – all freshly sourced and impeccably prepared the Hellenika way. Paired with an impressive drinks list and authentic Greek hospitality, it’s your Mediterranean must-go. Ouzo, anyone? ETTORE BLUES Taking inspiration from the iconic 80s design movement Memphis, ‘Ettore Blues’ is an exotic collection of resort wear and accessories from designer Lucy Folk. Our favourite pieces from the range include the ‘Playa’ robe ($450) and ‘Castellation’ crop top ($345) in golden eye stripe (both pictured).